Global printing manufacturer, Star Micronics, has teamed up with software provider, Synqera, to launch an in-store loyalty generating device. 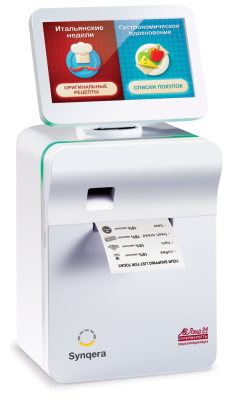 The Synqera Loyalty Generator is a compact printing device with interactive touch-screen, which can be located at store entrances to provide targeted content relevant to new and returning customers. It is being deployed by the upmarket Russian supermarket chain, Land, which operates 10 stores in St Petersberg. The device is activated with a loyalty card to print out personalised product recommendations relevant to individual shopping needs and recommend new products based on predictive analytics. It also offers recipe recommendations billed as ‘gastronomic inspiration’ plus themed shopping lists such as a romantic dinner, eco-friendly or low calorie. The Loyalty Generators at Land help shoppers find and discover products they need as well as incentivising loyalty programme members to purchases based on special offers and promotions. According to Ekaterina Savchenko, head of marketing at Synqera, this increases overall basket size for grocers, while also providing a marketing tool for recommended brand switching, product promotions, and upselling specific products. Synqera also offers the Simplate tablet device at the checkout, providing an interactive customer display and near field communication (NFC) technology. Also being deployed by Land, Simplate is integrated with POS software and enables customers to check their transaction and balance details on the loyalty card. It also leverages Synqera software to interactively recommend relevant products for shoppers to add to their basket, provide in-store coupons and targeted offers prior to finalising their purchases. And it enables collection and analysis of real-time customer feedback via an interactive survey on customer satisfaction.